Several longtime restaurateurs and chefs introduce a trio of eateries that merit a trip downvalley. Flip Wise, Lacy Hughes, and Kade Gianinetti stand in front of their new restaurant, The Way Home. After a couple years of languishing in the restaurant doldrums, Carbondale is feeling a fresh breeze, as three new dining spots are slated to open this summer on Main Street. Even better, all three venues have deeply local roots. The two-story Craftsman house at the corner of Seventh and Main, which once housed the beloved Restaurant Six89, is now seriously spiffed up and about to be reborn (by late summer) as The Way Home. 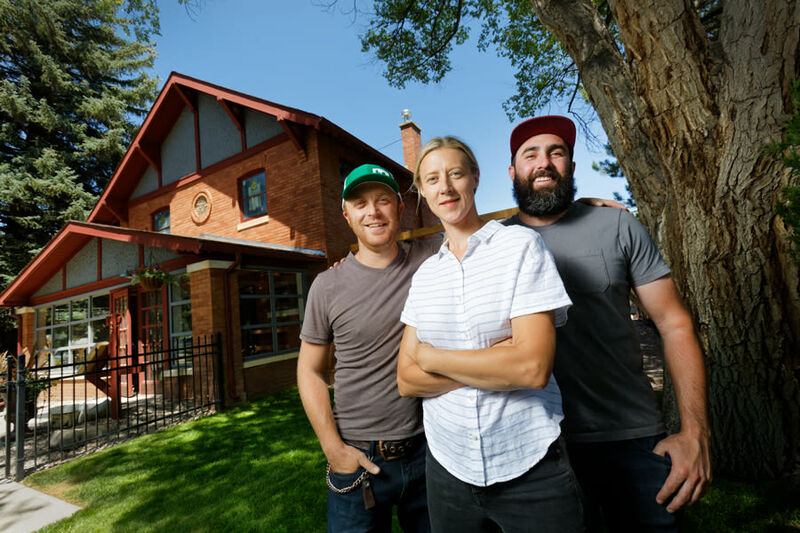 Hometown boy turned Denver restaurateur Kade Gianinetti has partnered with dining veterans Lacy Hughes, of Carbondale’s casually hip Silo, and Flip Wise, who most recently cooked at Basalt’s Free Range Kitchen and Wine Bar and at Meat & Cheese Restaurant and Farm Shop in Aspen. The Way Home will debut with a dinner menu that skews toward “clean, simple, thoughtful” dishes based on local ingredients, says Hughes. “We want to be both a restaurant and a community gathering place,” she adds, with some dishes that nod toward the many pioneering families who arrived in the Roaring Fork Valley from the mountains of northern Italy. Late-night service, with both dinner and a bar menu, will fill a deep hole in the downtown dining scene. Two renovated and expanded patios, plus two new hotel suites upstairs, will be icing on the cake. A few blocks up Main, the space at number 348 and that once housed Town will soon bustle again as Roosters. Hatched by the folks from Aspen’s now-shuttered breakfast/brunch/lunch specialist Over Easy, with an assist from former Grey Lady chef Kyle Raymond, the restaurant will offer a morning menu featuring multiple variations on eggs Benedict, plus fresh juices and other favorites imported from upvalley. “Dinner will feature a lot of rotisserie items beyond just chicken,” says co-owner Mladen Todorovic, “and we’re excited about offering lots of side dishes using the area’s produce.” Bonedalians are also pleased that the takeout counter up front, laden with pastries and snacks, is back in action, as is the big patio, with its afternoon shade and evening fire pit.